This Grandmother's Garden: A BLOOM! A BLOOM! I Found a BLOOM! A BLOOM! A BLOOM! I Found a BLOOM! The crunch under my feet as I walked across my lawn this morning verified the thought already foremost in my mind. "It's freezing out here!" But I was on a quest. 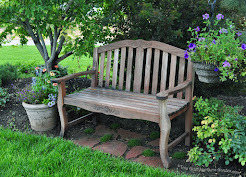 "I've got to find something blooming in my gardens... it's Garden Bloggers Bloom Day." As I walked down each frosty garden path my eyes searched intently for anything green and growing. Nada. Except, of course, the vibrant evergreens of my gardens that seem to be flourishing. "How do they survive in this cold?" I almost wondered out loud. "I'm going to have to lower my expectations." As I trudged along the frozen grass, I began to focus on the trees and shrubs for signs of swelling leaf buds. "They're kind of like blooms... waiting to burst... aren't they?" I was feeling a little desperate. I seriously inspected anything with a branch on it. Again I was disappointed. "A whole lot of warm has to happen before there's any bud swelling going on here." I kept walking, intent on finding something to post about. After I'd circled around our half acre several times, I was ready to give up. "There is nothing that even resembles a bloom here." Resigned to have to wait for a 'Wordless Wednesday' post I quickened my pace as I walked toward the door and the warmth that was surely on the other side of it. the Quick Fire Hardy Hydrangea near the back door. February, I Found A Bloom! Blooms that first appeared waaaay back in June, though weathered and dry, were still clinging to their branches. I smiled with satisfaction. "There's my post for the day." I quickly took a few shots with my camera but I couldn't help but marvel at the tenacity of those delicate little flowers. All through the Winter they have withstood the strong gusts of the notorious Highland winds that blow down from the tops of our mountains. 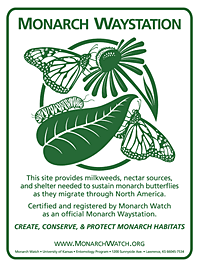 They have endured the sub-freezing temps that have been relentless for so many weeks. They have survived the deep snow cover that has finally, just in the past several days, begun to melt. "Wow. This hydrangea really is hardy" I thought to myself. I must admit to all, I fell in love with hydrangeas when we lived in Oregon almost a decade ago... land where just about anything grows. 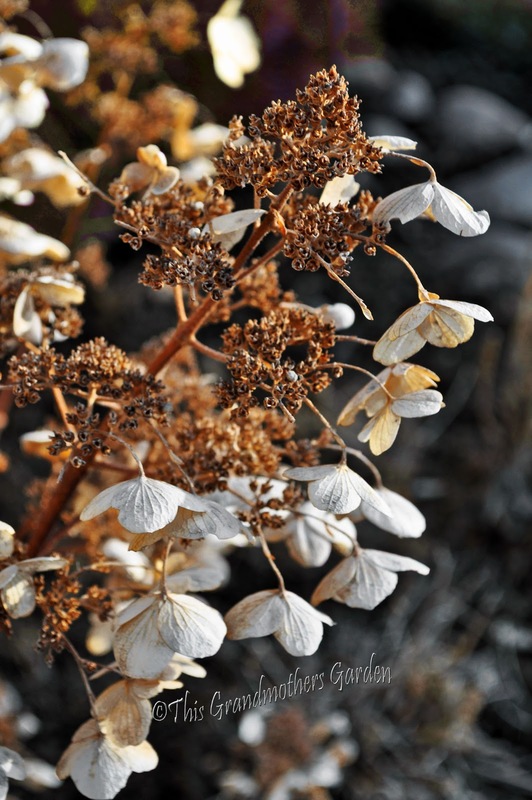 Hydrangeas have a tougher time in Utah and I was thrilled to find a variety that would thrive in my zone 5 garden. I have loved this hydrangea since I first planted it two years ago. Read more about this favorite of mine. 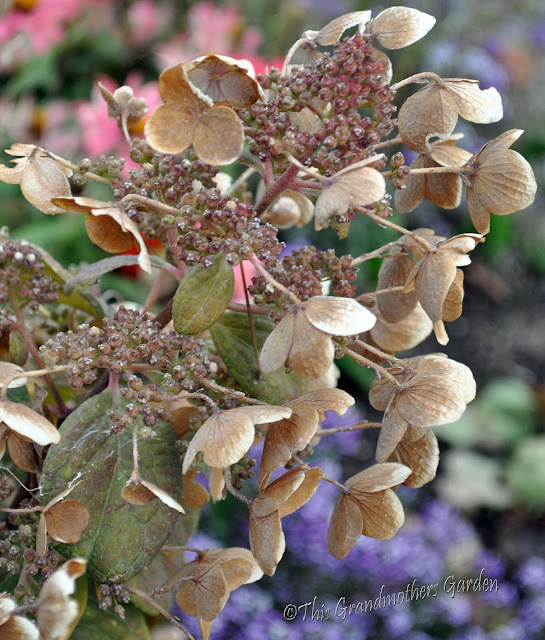 that you need to include this hardy hydrangea in your gardens. BTW, I planted three more of them last Fall. She thrives in Zones 3-9 and doesn't mind harsh Winters at all! Be sure to visit Carol at May Dreams Gardens for more GBBD posts! Just noticed the temperature gauge at the top right of my blog. It is 52°F now as I publish this post. The weatherman said we will reach 60°F today... Yipee! Catchy title. I could not believe you actually had a bloom. My hydrangea is hanging on like that too. With all the snow, the petals are holding fast. I keep featuring it each GBBD, but not this time, yet it still is there. Happy GBBD, Carolyn. 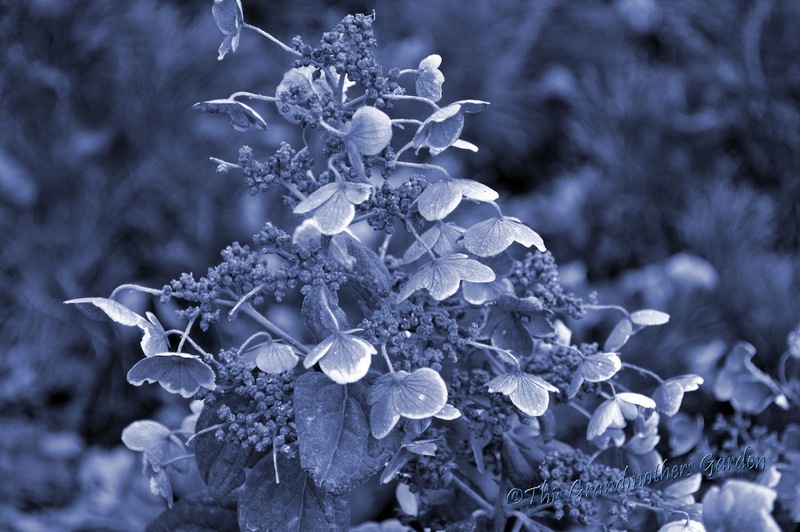 Fun visits of your hydrangea growing young back in time. She just keeps giving doesn't she? Great post. Gardeners tend to forget to celebrate the entire seasons of a beautiful flower. I'm looking forward to oakleaf hydrangeas soon, buds are swelling. Hydrangea blossoms in February? Amazing. Mine are just budding now in early spring. Lovely photos, you must be really looking forward to seeing the blooms of summer, I know I would be! I noticed my Hydrangea has fresh leaves on it today, I'll have to check my photo archives when they first opened last year - I'm certain they're much earlier. We had Hydrangeas in England and I miss them. Also I never see here - in South Florida - Rhododrendons, which grew so huge they used them to shield highways from homesites. Thanks for an interesting post, as always. haha - I could imagine you jumping up and down as you noticed the dried bloom still holding on. Delight is what makes gardens so wonderful, no matter what time of year. I'll have to look into that hydrangea, as I don't have one of that kind. 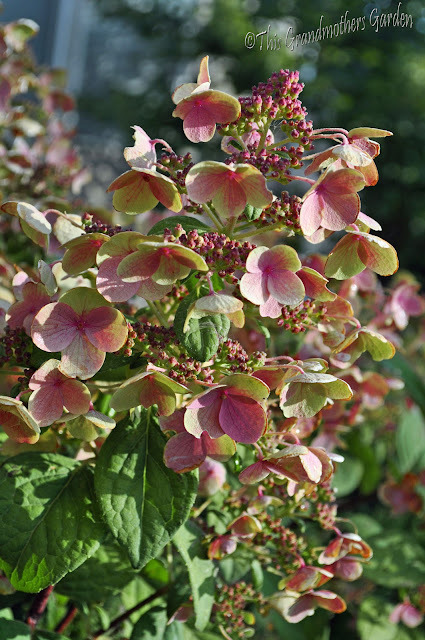 Hydrangea very hardy and can withstand the cold winter? 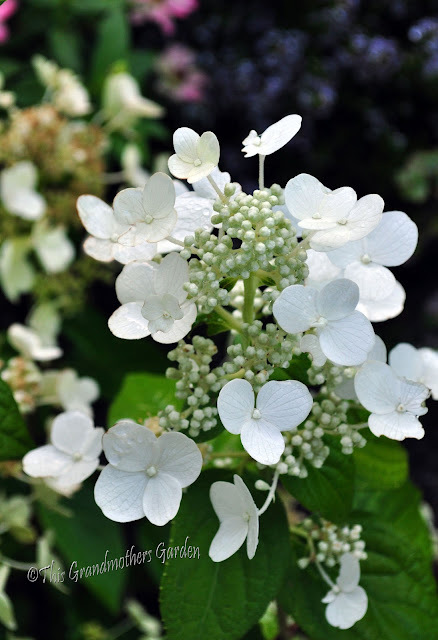 Thats something new Im learning, because before your post, I always thought hydrangea is such a delicate cry baby, at least here locally! Even without water for a day, mine will start wilting and becomes floppy, no hot sun for my hydrangea just place it in the shades..I love the photos of your baby from June till now! What a beautiful plant and timeline to illustrate its lasting power. 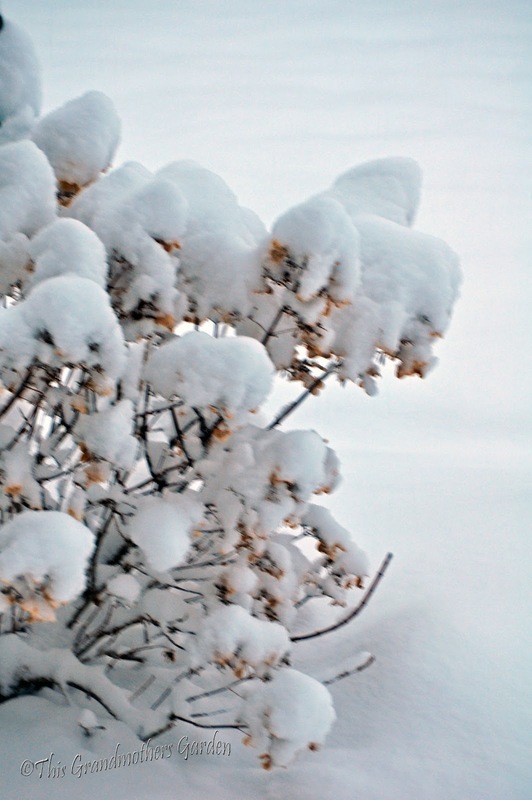 I do wish we could grow hydrangeas here.... I once lived in a place where they ringed most of my back lawn. 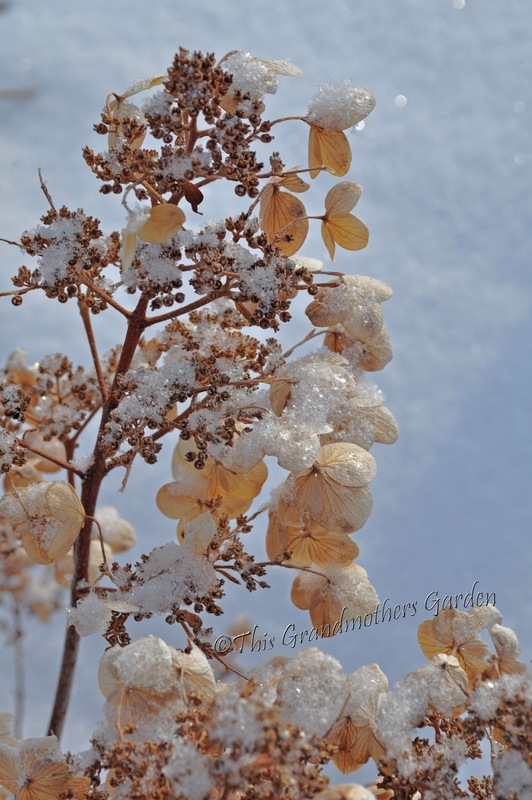 And, yes, the dried flowers are still beautiful in winter. I love Hydrangeas! And they're just as fascinating dried as in full bloom. Very nice collection of photos that show the plant in all seasons. Happy GBBD! Love the monthly journal of her growth. Great post! I love hydrangeas too, and it was great seeing you "regress" yours all the way back to fresh buds. I love your bloom! Quite and unexpected one but a bloom nonetheless:) Those hydrangeas paniculata are wonderful! I've looked at Quickfire but don't have her yet. I have 'Pink diamond', 'Tardiva' and 'Grandiflora'. I would think they'd work for you too. You just can't have too many hydrangeas. I did not know you moved from Oregon. That must've been a big change. I can't believe how many blooms you have on this plant and it looks great covered with snow. I plan on going Hydrangea crazy this year. I have two acres of bulldozed yard to mend this year down on Long Island and they thrive in the clay/gravel soil I have to deal with. i love the before and after shots especially the one's with frost and ice covering the dried blooms, its quite beautiful also at this state. I wish my Hydrangeas looked like this any time of year! Simply stunning! beautiful plant and photos. it must be so at home in your garden it copes with extreme cold. Wonderful post Carolyn! Your hydrangea has proved its worth over and over. I can see why you've added more to your garden. 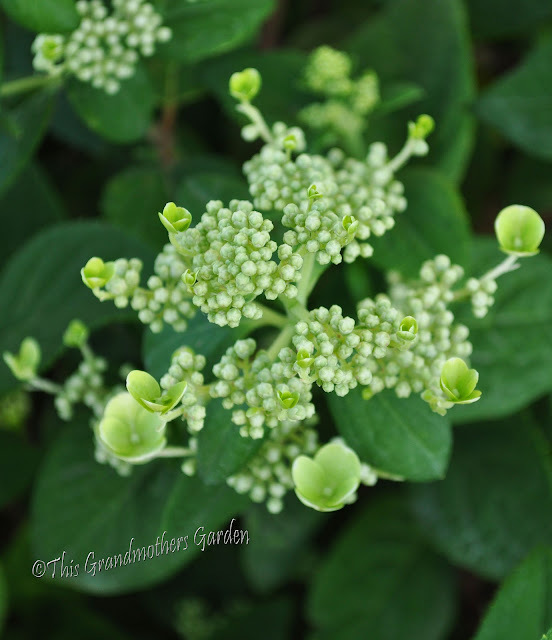 I'm excited about watching my oak leaf hydrangea this year to see how it performs...we don't have much luck with hydrangeas down here but it seems this particular variety can handle our bipolar weather! What beauties! I just grow a small pink blooming one called, 'Pia'. I wonder if it still has its dried blooms on it. Spring will get here, but it's hard to wait! 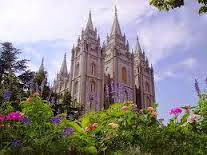 She is as beautiful today as she was in the beginning. The picture with the ice crystals is my favorite..
Great post and beautiful photos.